Having organised tens of sea voyages in this area, we have built a vast collection of the must-visit places all the way from Spain to Turkey. 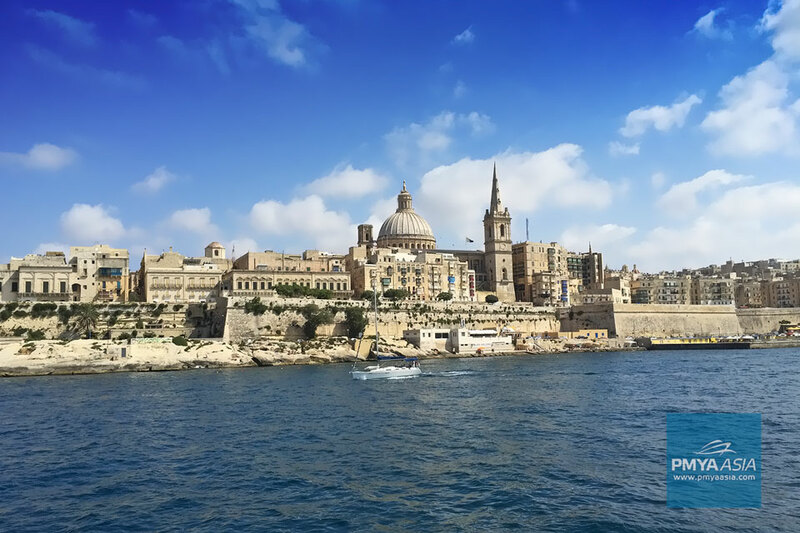 Below is a small part of this collection – 3 places not to be missed when cruising Malta. This little country captures the hearts of the visitors with its stunning architecture and friendly people. The level of crime in Malta is one of the lowest in Europe, and its native language is a bizarre mix of Arabic and Italian. English is the 2nd language of Malta, and it is very widely spoken. The Maltese Archipelago consists of a number of islands, with Malta, Gozo and Comino being the biggest and the only inhabited ones. 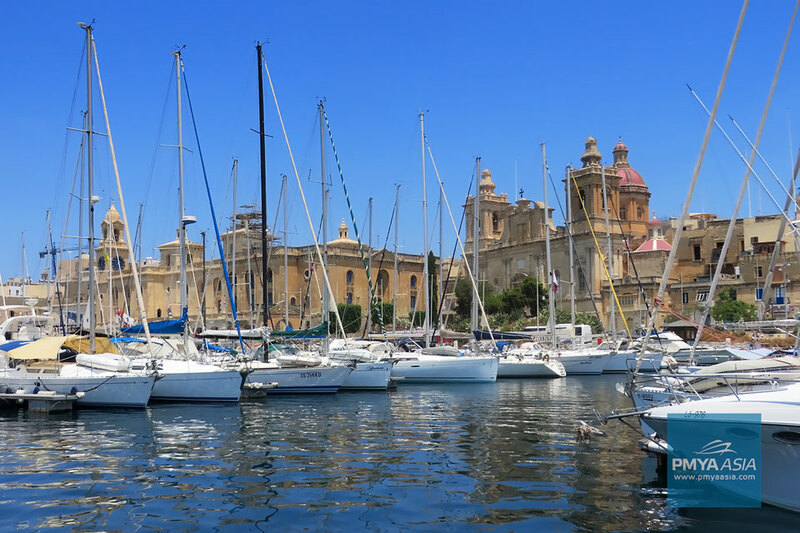 Its favourable location in the centre of the Mediterranean Sea and indented coastline with a plenty of nice anchorages make Malta famous for sailing. UNESCO called this smallest capital in the European Union as “one of the most concentrated historic areas in the world”. 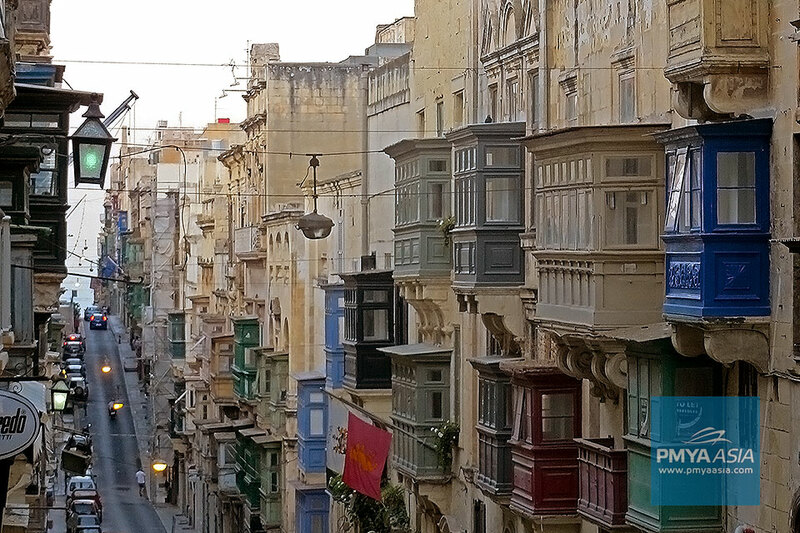 Covering an area of as little as 0,8 square kilometres, Valletta now proudly wears a title of UNESCO World Heritage Site. The construction of Valletta started back in the 16th century several months after Malta had just withstood the Great Seige by the Ottoman Empire. That is why Valletta is so well protected from outside invasions by the ditch and the high walls of the military forts. One of those walls is a venue for a unique restaurant called Rampila. Many of our customers fell in love with the place. 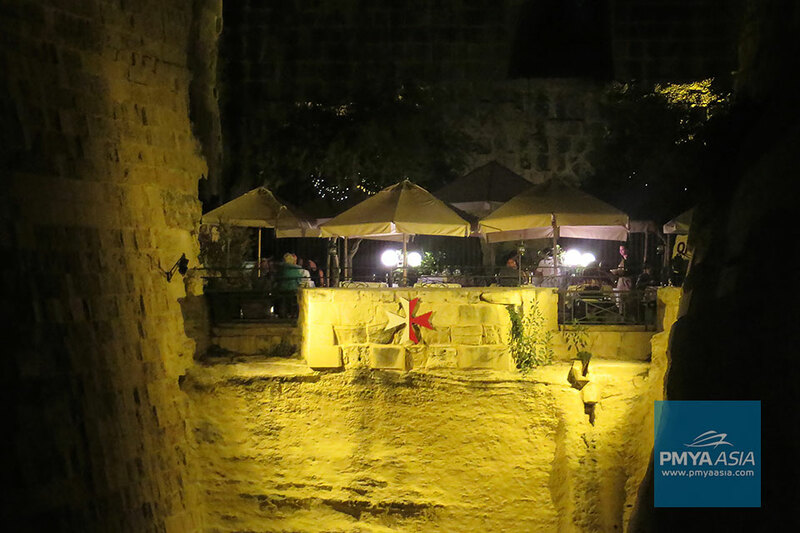 Designed and built by the Knights of St. John in the 16th century as part of the defensive bastions, Rampila is now a cosy open-air restaurant with good food and spectacular backdrop. Try the local speciality of Maltese rabbit there, and you won’t be disappointed. Valletta’s square streets intersecting at right angles and facing the sea are very convenient to walk. This construction scheme was introduced in the 16th century to make the cool sea air circulate in the hot Maltese summers. Most of the streets of the Old Town are pedestrianised and boast a good selection of shops. Perhaps one of Malta’s signature souvenirs you can buy is a filigree silver jewellery. The greatest geographical heritage of Malta, the Grand Harbour, is one of the most beautiful places we have ever seen. The Upper Barakka Gardens, a small flowered park and just a nice place, boasts the best view of the harbour. C&N Grand Harbour Marina is Malta’s newest and probably the most luxurious marina. Surrounded by a 500-year stunning architecture of Valletta and Vittoriosa, the marina creates a truly unique atmosphere. The prices there are a little higher compared to other marinas but the choice of restaurants is probably the widest, and the staff is very professional and helpful.Besides, it takes only 5 minutes from the marina to Valetta’s Old Town by the water taxi departing every 30 minutes. 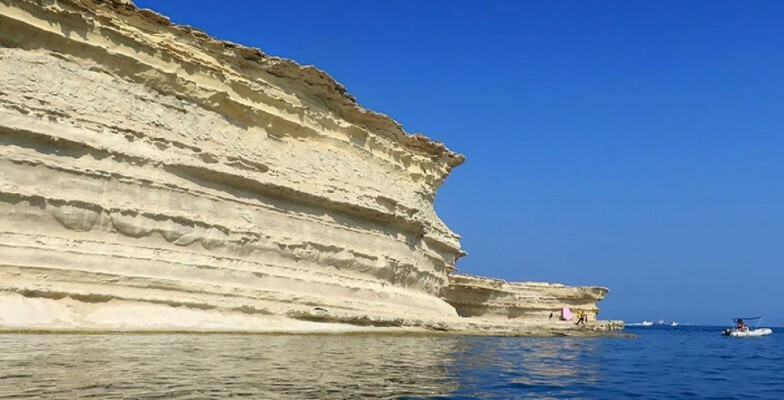 Il-Hofra z-Zhgira and Il-Hofra L-Kbira are two fabulous bays in the south-east of Malta. The coast here is completely snow white with chalk cliffs. This is why there is no land access to the bays. Staying on anchor in one of them you can see what’s happening in another through the “windows” in the rock. The favourite spot for the local cliff divers, St Peter’s Pool, is just next door to the bays. It is actually a clear sea water pool surrounded by the white chalk cliffs. 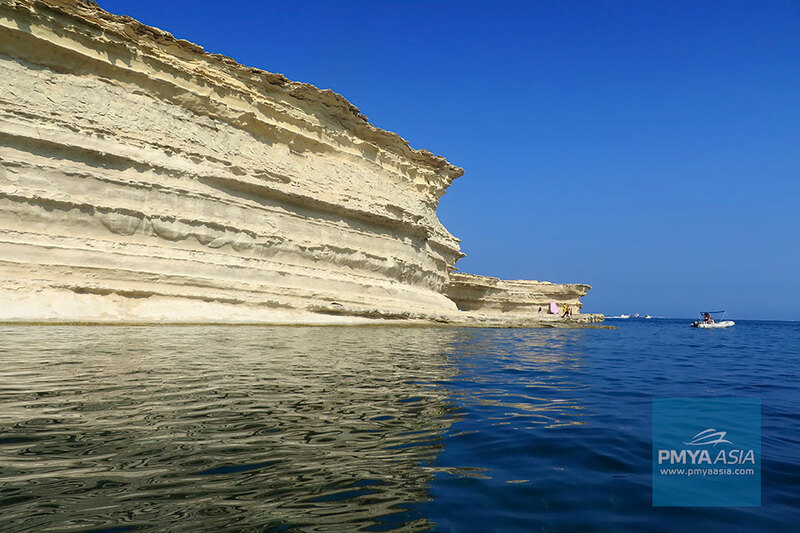 Make sure you include the unique Il-Hofra bays in your itinerary when cruising Malta. They were recommended to us by the local resident who we are very grateful to. For some reason tourist brochures almost do not mention this fantastic site.